I’m in the process of gathering rough drafts, editors’ letters, research and other materials for my poems, novels, and picture books, putting them in cardboard boxes, and sending them to the Special Collections of my alma mater, Gettysburg College. 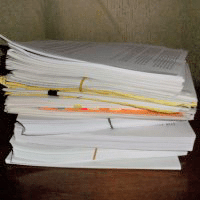 In addition to the final drafts of each work, this includes twenty-two years-worth of scribbles, hastily typed pages, bad drawings, coffee stains, photo copies, emails, and other assorted goodies. This takes some time, as you might imagine. But, as it turns out, it’s been a wonderful opportunity for me to re-visit my very messy, random, and non-linear process of composing. Sometimes I feel badly when students ask me to explain my “writing process.” I always try to explain the best I can but, at its core, my method remains pretty random: I try something. I see how it feels, how it sounds. I go a bit further. If it isn’t working I try something else. Repeat this dozens of times. Eventually, I might have a good book. And if I don’t, I try again. So glad you are finding the time to do this, Jen! And so happy that you are getting as much from the process as our patrons will when they access your papers! That HAS been a great thing for me to do . . . both practically (for the sake of my poor over-stuffed office) and also professionally. It’s made me take stock of the paths I’ve taken–or not taken–in my decades-long journey as a writer. In fact, I just dropped off yet another box w/ Carolyn S. yesterday!